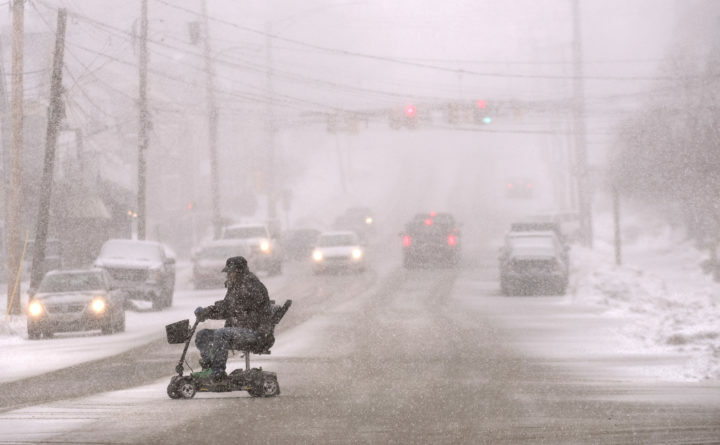 A man rides an electric wheel chair on Union Street as heavy snow started falling in Bangor Tuesday afternoon. 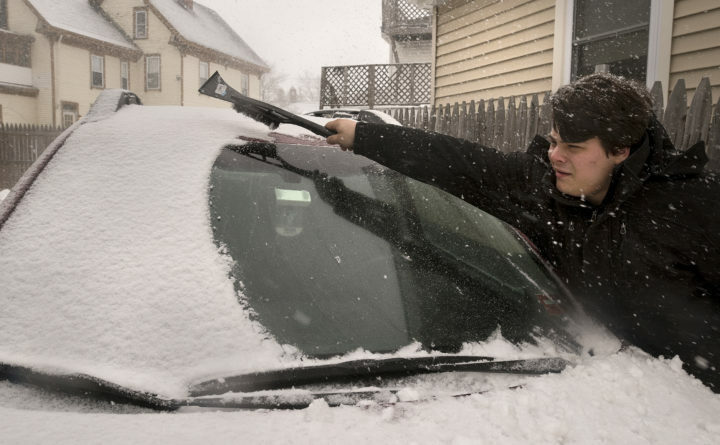 Eric Lehman of Bangor clears snow from his car as he was getting ready to leave his house to help out a friend. Heavy snow started falling in Bangor Tuesday afternoon. Kristie Billings of Ellsworth walks away after shopping at John Edwards Market on Main Street in Ellsworth during the nor'easter on Tuesday. Pedestrians make their way up the sidewalk in front of Lincoln Park in Portland on Tuesday. Much of Maine was shut down Tuesday as the third nor’easter to hit New England this month left the state under several inches of snow. Snow started falling early Tuesday in southern Maine and reached eastern Maine around noon. By midafternoon, snowfall amounts ranging from 4 inches to 10 inches had been reported in scattered locations throughout Maine, while some locations in New Hampshire had gotten more than a foot. By late Wednesday, a total of between 14 and 20 inches of snow is expected to fall in eastern and northern Maine, including the Bangor area, with the far northern part of the state projected to get between 8 and 15 inches, the National Weather Service indicated Tuesday afternoon. 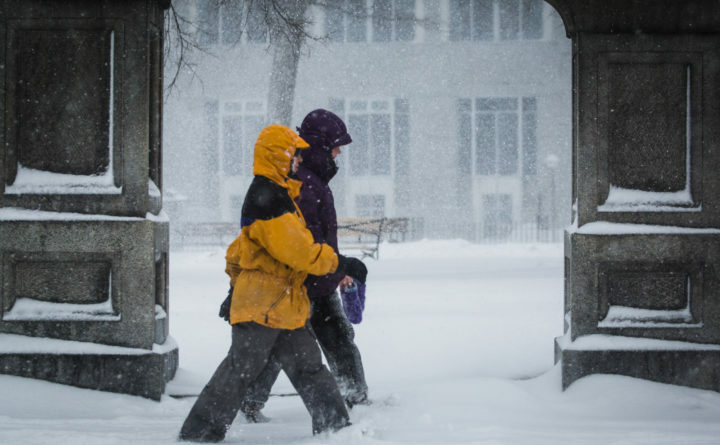 Southern, western, central and midcoast Maine are expected to get between 12 and 18 inches. The weather service also issued a blizzard warning for the coast, where wind gusts as high as 50 mph could cause whiteout conditions in blowing snow. The blizzard warning is expect to remain in effect until Wednesday morning. Both snow and wind will lessen from southwest to northeast during the evening hours with lighter snowfall continuing overnight and into Wednesday in some areas, they added. Storm conditions in far northern Maine are expected to continue through Wednesday night to around sunrise Thursday morning. There were some power outages Tuesday but they were sporadic and not widespread. A few thousand Central Maine Power customers in Knox, Somerset, and Kennebec counties lost electricity during the course of the afternoon, but had power restored by late afternoon or early evening. Outages for Emera Maine were mostly in scattered clusters of a few dozen. The company had 650 customers in the Ellsworth area without power for about 30 minutes Tuesday afternoon, but that was so the company could repair a piece of equipment, according to a company spokeswoman. Schools across Maine had early dismissals or closed early Tuesday in anticipation of slippery roads and poor visibility. State offices closed at 12:30 p.m. due to the storm. Dozens of schools throughout the state, including those in Bangor and Brewer, also canceled classes on Wednesday due to weather. Suzanne Krauss, director of the Maine Emergency Management Agency, said Tuesday in a prepared statement that travel and visibility will be the biggest challenges posed by the storm. “There may be some power outages, but hopefully not too many with a light, fluffy snow predicted,” she said. Blizzard conditions along the coast may result in some flooding, state officials said, adding that the public should monitor alerts and warnings through media. Storm information also is available via a free Federal Emergency Management Agency app. Vic Nouhan, a meteorologist with the weather service in Caribou, said the snowfall would clobber Maine hardest on Tuesday afternoon. In the hours before nightfall, snow could fall as fast as 2 inches per hour, Nouhan said. “That’s when the dangerous snow rates will be,” around when people are usually driving home from work, he said. The weather service urged people to stay off the roads during the heaviest snowfall Tuesday. Tuesday’s storm is the third nor’easter to strike the Northeast in roughly the past 10 days. A March 2 storm battered the New England coast with high tides and heavy winds. An estimated 2 million electricity customers through the region lost power in that storm, including a few thousand in Maine. The storm caused significant coastal flooding and was blamed for the deaths of nine people outside the state. Last Thursday, another storm dumped about a foot of heavy snow throughout much of the state and knocked out power to around 27,000 Mainers, mostly in York County. Even before this latest storm, Bangor had surpassed the amount of snow it got last winter, according to National Weather Service data posted online. Bangor got 82.6 inches of snow from November 2016 through April 2017, but so far this winter has gotten 87 inches. Bangor’s snowiest winter on record was in 1962-63, when 181 inches fell in Maine’s Queen City. Prior to Tuesday, Portland had 75.5 inches of snow this winter, roughly 2 feet more than it normally has this time of year. 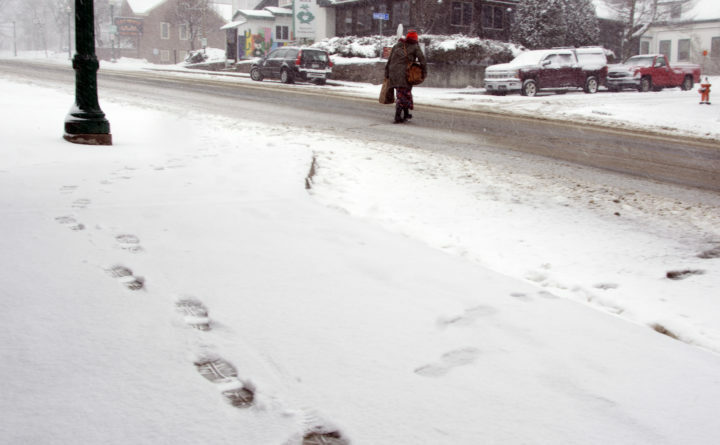 Portland needs about another foot to match its snowfall total last winter of 87.4 inches. BDN reporter Callie Ferguson contributed to this report.